AAA Five Diamond Fairmont Scottsdale Princess reflects the dynamic desert that surrounds it, with a mystical expansive landscape of lagoons, fountains and fire pits-set amid the majestic McDowell Mountains. Blending exquisite pampering and personalized service with four award-winning restaurants, state-of-the-art meeting facilities, six pools including a white sand beach, innovative Well and Being Spa and two championship golf courses, this highly acclaimed resort is truly an experience like no other. 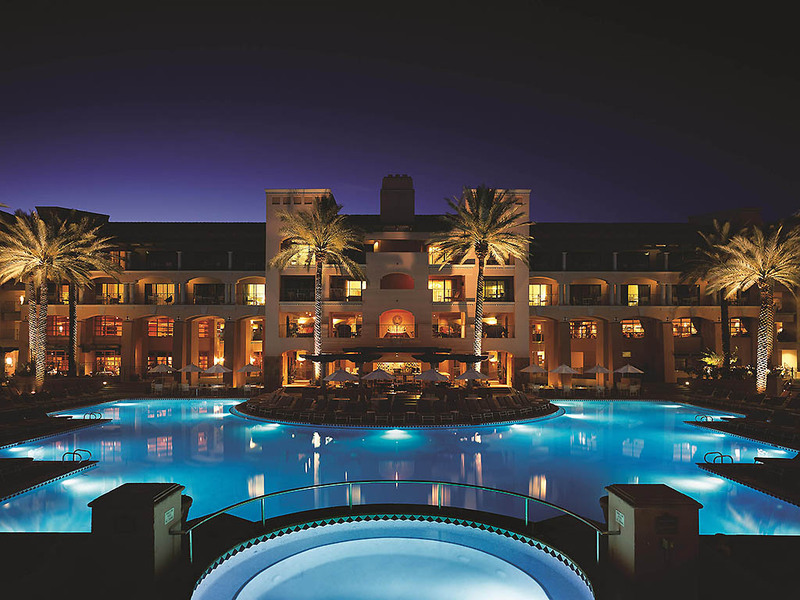 Arizona's longest consecutively running AAA/CAA Five Diamond resort property since 1991.
o	The Fairmont Scottsdale Princess offers 750 richly appointed guest rooms, including two Presidential Suites, 69 newly renovated Fairmont Gold Rooms and 119 Casitas. Modern and iconic, yet relaxed and inviting, this luxury resort features updated authentically local styling and panoramic views of Scottsdale and the Arizona desert beyond. Whether traveling for business or pleasure, indulge in a full range of amenities, a heartfelt welcome and genuine service. Voted the number1 Mexican Restaurant in Arizona, indulge in a delectable paradise of fresh, modern Mexican cuisine. Come see what we mean by "Old Ways, New Hands" as you savor classic Mexican recipes in enticing new ways. Experience Chef Richard Sandoval's restaurant located at TPC Scottsdale, featuring authentic Pan-Latin cuisine and the largest rum collection in the Valley in a vibrant, upbeat atmosphere. Enjoy small plates designed for sharing and signature 'suviche'. Indulge in a tantalizing menu featuring the finest cuts of grilled beef and poultry or the freshest seafood combined with local seasonal ingredients. Pair your meal with modern American sides, complemented by a selection from our 3,000 bottle wine cellar. Savor classic American fare at Ironwood American Kitchen. As the main dining room at the Fairmont Scottsdale Princess, this casual bistro offers fresh all day cuisine in a warm and inviting atmosphere overlooking the resort's Princess Pool. Relax at our poolside cafe at the Fairmont Scottsdale Princess. Featuring sandwiches, grilled burgers, chilled salads, soft drinks, cocktails and frozen drinks, this breezy bar keeps you cool in the Scottsdale Arizona sun. Step into a chic setting blending modern resort bars with inviting fire pits to enjoy a gorgeous Arizona evening. The Plaza Bar specializes in mixology driven, signature craft cocktails, craft brewed beers and wine, and a selection of fine cigars.